The U.S. leads the global landscape in technology innovation. 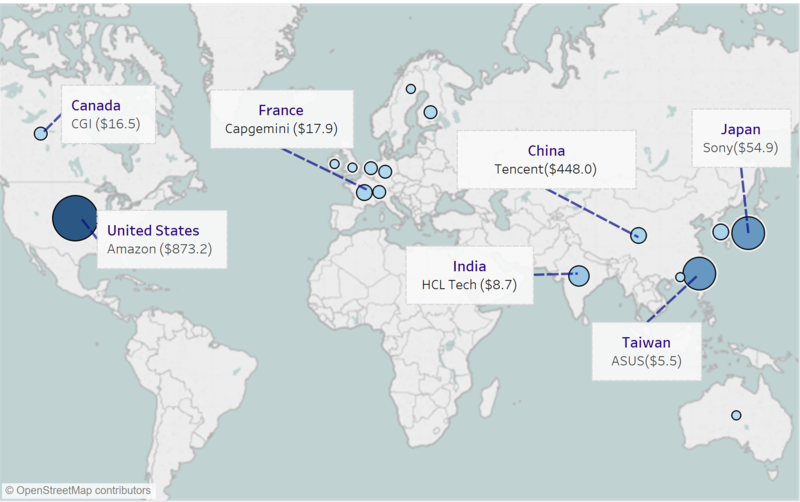 The country’s competitive edge, according to the World Economic Forum’s 2018 Global Competitive Index, is due to its business dynamism, strong institutional pillars, financing mechanisms, and vibrant innovation ecosystem.1 Innovation is a trademark feature of American competitiveness and has powered its global dominance since the post-World-War industrial revolution. Countries that lead the world in generating advanced technologies and leveraging the full productive capacity of their digital economies can gain a strategic competitive advantage. Digital technologies have risen to prominence as a critical determinant of economic growth, national security, and international competitiveness. The digital economy has a profound influence on the world’s trajectory and the societal well-being of ordinary citizens. It affects everything from resource allocation to income distribution and growth. In the digital era, innovation, entrepreneurial dynamism, and information and ICT production will drive America’s competitive edge. The ICT industry and ICT-enabled industries make important contributions to economic growth. This paper attempts to value those contributions and benchmark the importance of the ICT sector in the U.S. economy by assessing its contributions to economic growth, job creation. The sector’s downstream contributions to the small business ecosystem and investments in reskilling and upskilling initiatives are examined. Finally, systemic challenges related to data privacy, trade, and immigration facing the sector are reviewed. Deep investments in ICT assets: Computer hardware, software, and internet, and broadband infrastructure, for example, are crucial determinants of growth in advanced economies. An OECD study by Vincenzo Spiezia posits that increased GDP growth and country-specific global competitiveness can be primarily attributed to growth rates in ICT investment.5 The impact of ICT assets, measured as the value of ICT-capital services as a percentage of GDP, is instructive in assessing the ICT sector’s full growth contribution. And on that front, the U.S. has secured a global lead, maintaining relatively strong competitiveness compared with other OECD member states. India and China have emerged as front-runners in this space, particularly with respect to the high levels of capital (or capital services) that ICT assets bring to GDP growth. In addition to the demonstrated positive impact from ICT sectors on the total economy, a transformational shift has occurred from the ICT manufacturing sector to the ICT service sector. This move from a hardware- to software-centric level of growth has been particularly pronounced in developing countries due to deeper and wider mobile-cellular networks.6 Moreover, the maturing mobile ecosystem has been fueled by greater accessibility among mobile internet users and the affordability of smartphones and portable devices. Beyond the increasing contributions of ICT-services to GDP growth, investments in the ICT sector have significantly boosted labor productivity.7 In this area, the U.S. economy has maintained its global leadership position with despite only incremental increase in wages from $62 per hour in 2005 to $71.2 per hour in 2015. China and India have also benefited from prior structural investments in ICT sectors, especially in terms of internet infrastructure and mobile operating platforms. The McKinsey Global Institute notes the economies of scale that mobile users and the proliferation of e-commerce have brought to ICT sectors.8 These emerging developments have benefited from ICT investment and doubled labor productivity between 2005 and 2017. Conversely, such high levels of productivity have remained notably absent in most OECD member states; their median of labor productivity has only increased incrementally to $54 per hour despite holding historical advantages at $51 per hour. Spending on R&D innovation has spurred labor productivity and the integration of ICT with the broader economy. 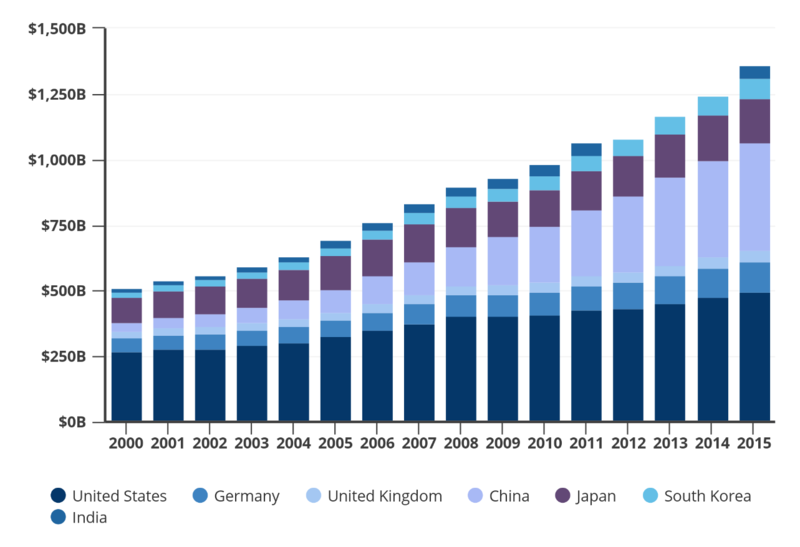 The U.S. is a clear front-runner in this category: Total spending on R&D grew from $268.6 billion in 2000 to $496.6 billion by 2015 (Figure 4). 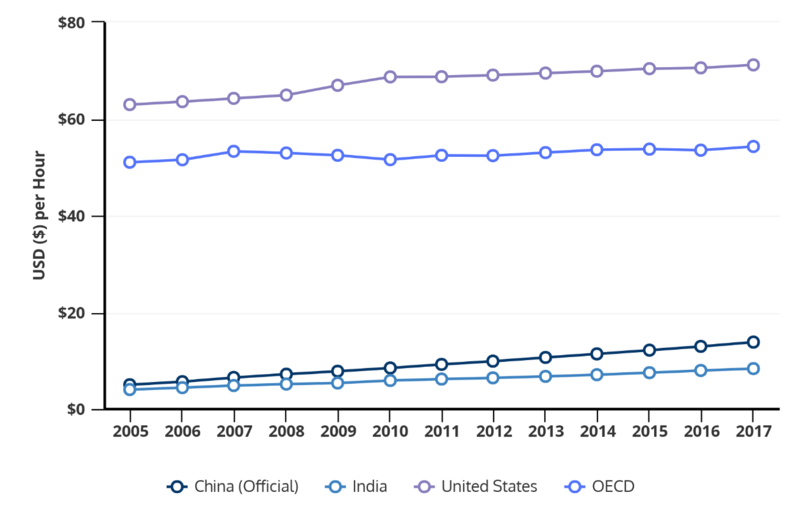 While OECD peer countries increased their spending during this period only incrementally, India and China have made substantial R&D investments (in terms of total dollar amount)—eclipsing the investment totals of all other nations. 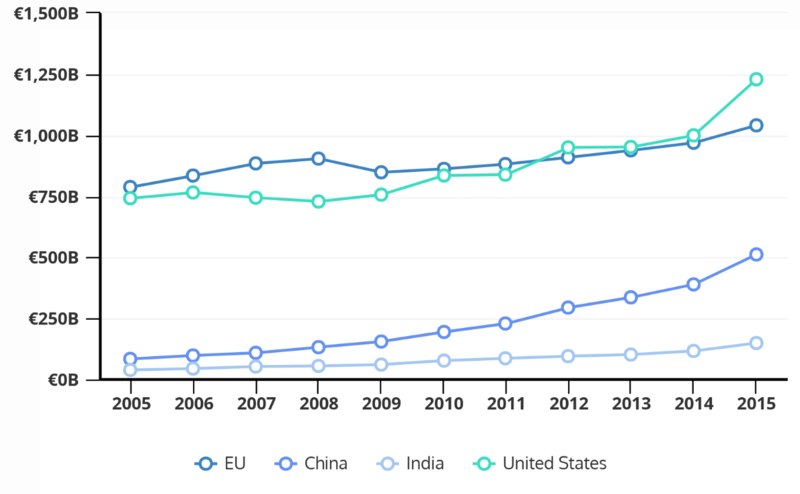 India’s spending on R&D tripled, whereas China’s spending increased more than tenfold. These substantial investments in innovation have bolstered the swift transformation of these countries’ economies. In light of these developments, the U.S. and other OECD members should continue to prioritize investment in ICT at the state and local levels to maintain global competitiveness and boost labor productivity. Targeted ICT investments in 5G technologies and infrastructure along with R&D innovation combine to bolster the digital economy and accelerate the ICT-sector’s diffusion effect to less technologically-intensive sectors. Policy-guided investments can augment the capital contributions that ICT sectors make toward GDP growth and will boost labor productivity as a result. Taking all these factors into account, it is evident that the IT industry is central to the digital pivot for developed and developing countries. In the U.S., the industry’s share of real economic growth has risen steadily since 2007, propelling the sector to relative prominence. Accelerated adoption of rapidly developing technologies such as cloud computing, robotic automation, artificial intelligence (AI), machine learning, the internet of things (IoT), and 5G technologies is promising for the IT industry and should promote ongoing growth. Within and outside information technology (IT), the U.S. has delivered slow and steady economic growth since emerging from the financial crisis. U.S. GDP growth averaged 2.3 percent between 2010 and 2018, according to BEA figures. Diving below aggregate GDP statistics reveals a diverging growth story within which the services-producing sector headlines as a growth protagonist. Services-producing industries, which account for more than 80 percent of total output, have anchored much of U.S. economic performance and post-crisis recovery. The IT industry is growing in dominance within the services-producing sector, powered in large part by a vibrant technology sector. But the industry is relatively small in absolute size, accounting for only 6 percent of the total economy, says BEA. The ICT sector is a growth powerhouse, despite its diminutive stature. Over the last four years, the industry has driven remarkable gains, powering real economic growth and employment. The proliferation of digital technologies will continue to bring unprecedented structural changes to the U.S. economy, cementing the IT industry’s position as a leading source of growth and employment. Yet exactly how the IT industry will shape various aspects of the economy remains difficult to predict. 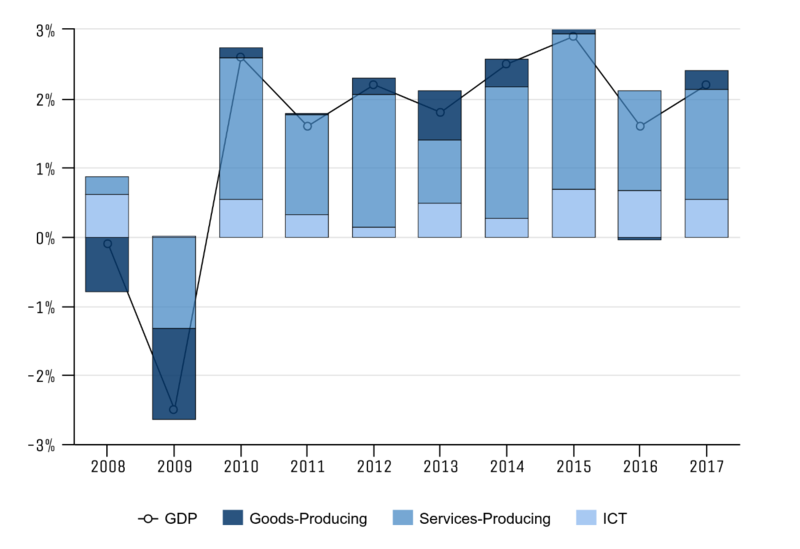 What is clear, is that the IT industry has expanded since the Great Recession, outpacing the value-add contributions of goods-producing industries to gross domestic output (Figure 5). Declining prominence in goods-producing sectors is not exclusive to the U.S., in fact this trajectory is consistent with similar trends in OECD peer countries and other advanced economies. The IT industry is also impressively robust. It persevered through the U.S. economy’s slow recovery, growing from an annual value-add of $835 billion in 2008 to $1,480 billion in 2017—an increase of 77 percent (Table 1). The services-producing sector, though much larger, grew 20 percent over the same period. Meanwhile, the goods-producing sector posted a modest 5 percent increase to real economic growth. In 2017 alone, the IT industry’s contribution to real economic output exceeded that of the professional and business services, finance and insurance, and manufacturing sectors, according to BEA figures on industry contributions to GDP. Although the industry has inspired sweeping business model changes and produced considerable business value across the value chain, the effects of mounting IT investment spending will likely be dampened by rapidly decreasing costs of technological solutions, driven largely by automation. Despite the changing cost structure of the technological distribution channel, growing IT spending should continue to have a net positive impact on the industry and on aggregate real economic output. Analyzing aggregate growth trends in the IT industry provides a useful but incomplete picture of the sub-industries that are critical to its growth and the broader economy. The industry is composed of three major sub-industry groups with related yet distinct core production activities: semi-conductors and semi-conductor equipment, software and services, and technological hardware and equipment. Examining disaggregated growth patterns within the IT industry can clarify how prior performance has underpinned its overall trajectory. According to BEA figures, the broadcasting and telecommunications industry is the largest in absolute size but generated 14 percent of the IT industry’s growth gain between 2007 and 2017—the lowest rate for all sub-groups. By contrast, the data processing, internet publishing, and publishing industries (including software) produced tremendous growth rates that belie their size. The data processing, internet publishing, and other information services sector increased its contribution to GDP threefold between 2007 and 2017, ballooning from a value-add of $65.2 billion to $263.6 billion. Meanwhile, the publishing industries sector (including software) saw its share of real economic growth rise by 39 percent. An increasingly digital economy, driven by non-physical outputs (e.g., service delivery, software, and computing), will be the centerpiece of the U.S.’s global competitive advantage. However, quantifying precise value-add contributions is difficult under the current growth accounting framework. Classifying ICT services is especially challenging, as grouping this sub-industry’s primary production activities blurs the lines between services provided and technology produced. Data processing, internet publishing, and other information services are the fastest-growing segments of services-producing industries. Rapid adoption and commercialization of digital technologies in non-ICT industries, which have inspired substantial productivity gains, may also lead to severe underappraisal of the value-add contribution of the IT industry and its overall employment gains. The demand for IT-based services is disproportionate across many industry verticals; however, certain sectors present appealing opportunities for revenue generation for IT service providers. Whereas aggregate IT spending is expected to rise on a global scale, growth will be unevenly distributed across key geographical markets: North America (the U.S. and Canada); the Asia-Pacific region; Europe, the Middle East, and Africa (EMEA); and Latin America. This shift toward innovation is no more evident than in the rapid proliferation of enterprise software systems, projected to be the fastest-growing IT segment worldwide in 2019. The convergence around this inflection point toward enterprise cloud-based digital transformation and innovation will remain a key source of opportunity for IT-service-based providers. Automation will undoubtedly shape the IT industry’s future as well. Automation offers the potential to improve productivity by introducing robots and AI into the workplace. These tools will help employees complete more tasks and leverage human capabilities. Automated processes and digital assistants can also facilitate worker productivity, bringing substantial benefits to the macroeconomy. These developments are promising for productivity, but their impacts on workers remain to be seen. Organizations may be able to do more with fewer people. If that happens, society at large could be threatened as fewer workers would be needed to service the economy; if companies can get by with fewer employees, job prospects will certainly be affected. New jobs will undoubtedly be created in this scenario, and the demand for data sciences, coding, digital platforms, and e-commerce will grow—but aside from delivery jobs, it will be difficult for affected workers to develop the skills needed in these areas. The mismatch between skills required and workers’ capabilities will necessitate the expansion of worker retraining programs. The rapid rise of the digital age and the IT sector has shaped nearly all contours of the U.S. economy, helping to fuel upstream and downstream growth in employment and productivity, small businesses, and corporate investments in workforce training for the digital age. Since 2006, the IT industry has experienced drastic shifts in its conventional to current form of production and related service delivery. The BEA has recognized this change and, under its newly released account of the digital economy, introduced a sub-category called the “IT and Related Industry” to capture the growing overlap between information services and professional service delivery. According to the BEA, employment in the IT and IT-related industry has grown substantially. Annual growth figures, except during the U.S. subprime mortgage crisis of 2007 to 2009, expanded at almost twice the rate of the total employment market from 2006 to 2016.18 The highest annual growth rate reached over 4.1 percent in 2014, double the employment growth rate of the total economy in the same year. Based on data from the U.S. Bureau of Labor Statistics regarding projected employment in the year 2026, service-providing industries are expected to account for the majority of 11.5 million newly created jobs.19 Among the top five fastest-growing industries over the next decade, the IT-related industry holds two positions: Professional and business services together with professional, scientific, and technical services will account for 15.4 percent of projected new jobs. In addition, the total U.S. economy is anticipated to expand job opportunities at a compound annual increase of 0.7 percent from 2016 to 2026. The professional and business service industry will be a burgeoning driver in creating potential job opportunities at a compound annual increase of 1 percent during this time frame. Jobs within the traditional IT industry are only projected to grow at a compound annual increase of 0.2 percent by comparison, slower than average within the total economy. The IT industry was the most promising domain with respect to job creation between 2006 and 2016. The industry’s employment growth trajectory becomes more apparent through a disaggregated picture at the sub-industry level, which reveals incremental shifts within the total sector, especially in professional service delivery. Job growth patterns at the sub-industry level highlight IT service delivery as a major contributing factor to the professional service delivery sector. Job growth in this sector also signifies further integration of the IT service industry with other-sector economic activities. This trend exemplifies the role of the IT service delivery industry in supplying services to other sectors and its influence on the expansion of the U.S. job market. When examining productivity of the IT and related industry, it is important to include its digital spillover value towards non-ICT industries. Huawei and Oxford Economics (2018) assert that a robust digital economy includes direct digital products along with digital spillovers from primary digital industries to secondary, non-digital industries. In such an accounting framework, Huawei and Oxford argue that “digital spillovers” should play a key role in estimating the true productive capacity of a digital economy.22 A prime example of increasing integration between the ICT and non-ICT sectors is the ICT sector’s consistent contribution to the productive capacity of other sectors; between 2006 and 2016, the ICT industry accounted for more than 11 percent of the total supply of commodities and services within the U.S. Despite its relatively small size as measured by GDP output statistics, the ICT industry has played an instrumental role in driving economic growth and employment within the U.S. economy. Through varied platforms and cost-effective access to cutting-edge technologies, small businesses have the foundational support to spur innovation, commercial collaboration, and important knowledge transfers within the small business sector. These benefits will emerge in more pronounced ways as newer digital technologies (e.g., cloud-based services) mature and penetrate non-ICT segments. Tools such as cloud computing, big data, and customer-relationship management systems are similarly central to tech-optimism. Not only do these innovations help businesses assimilate into the digital ecosystem, but small businesses’ willingness to invest in these capabilities and other IT-related services exposes them to better local market opportunities and profit margins. Additionally, according to a survey by the U.S. Chamber of Commerce, higher technology adoption rates are tied to confidence in small business health and cash flow—essential conditions for successful scaling in the small business ecosystem. SBEs, driven in part by their readiness to spend on IT services and infrastructure, will emerge as an important consumer constituent to the ICT services industry. ICT software and platform infrastructure are providing unprecedented opportunities for small businesses to scale without the commonly accompanying price tag; historically, these factors represented major barriers to technological adoption in small business markets. Recently, however, a mass transition to cloud-hosted accounting software applications unfolded within the small business ecosystem and laid the groundwork for other systems’ entrance thanks to cloud-based applications. Cloud-based technologies represent another game-changing opportunity for small businesses, offering access to new markets and bringing unexpected benefits to the value chain. Lund and Tyson (2018) point out that the benefits of digital technologies in the small business ecosystem carry implications for global trade patterns. They further contend that online marketplaces/platforms are critical mechanisms for trade growth, especially as smaller transactions increase in scale and relevance for economic growth. The evolutionary rise of micro-multinational enterprises with access to new markets has been made possible thanks to retail intermediaries such as Amazon in the U.S. and Alibaba in China, which host 2.0 million and 10.0 million third-party sellers (micro-multinational enterprises), respectively. Cloud-based technologies also hold great promise for the small business ecosystem as a defining digital technology with a demonstrated capacity to positively disrupt the value chain. In a survey assessing small business openness to cloud computing technologies in Australia, Fakieh et al. (2016) observed that small companies were motivated to adopt cloud-based technologies because of cost savings for firms with limited budgets and substantial returns on productivity and business outcomes.24 Additionally, the authors note that affordable cloud computing technologies are essential to boosting SME productivity and business outcomes. According to Cisco’s Global Cloud Index, private and public cloud workloads are expected to increase appreciably by 2021 and to grow by compounded annual growth rates of 27 and 73 percent, respectively.25 The Global Cloud Index expects software-as-a-service (SaaS) to be the primary driver behind cloud-service delivery models; in fact, SaaS is expected to account for 75 percent of global cloud workloads by 2021. SaaS and platform-as-a-service will also facilitate the transformation of big data, AI, and machine learning analytics into accessible technologies for small businesses. Luo and Bu (2015) state, “ICT significantly facilitates effective knowledge sharing and knowledge integration, which further bolsters value chain integration and synergy development among primary and support activities of a value-chain system.”26 A stream of emerging research continues to add credible evidence to the role of the ICT sector as a growth-enabling channel that enhances small business productivity, competitiveness, and ultimate value-add to domestic economic growth. Cook’s rationale for selecting China as Apple’s manufacturing home base for the iPhone was more about China’s skilled workforce—in terms of quality and quantity—than the low cost of labor. Cook argues that in China, “You could fill multiple football fields” with tooling engineers; in the U.S., however, “I’m not sure we could fill the room.” Cook connects the competitive advantage of China’s skilled workforce to a longstanding priority on applied vocational training within the country’s education system. Building a highly skilled workforce is vital to maximizing the ICT sector’s productivity growth potential and sustaining America’s global competitive advantage. While broadening technological adoption has been tied to industry growth, the widening collection of digital technologies compounds these labor market trends. Increased access to IT infrastructure and digital technologies continues to shape workforce needs within the IT industry as well as non-IT sectors. As a consequence, organizations are rapidly integrating emerging technologies into their business processes and accelerating the transformation of their workforce needs. Amidst a “reskilling revolution,” hiring and developing a company’s talent pool from within, rather than competing with large industry peers and smaller innovative companies, has been increasingly lauded as the new “recruiting tool” and a more effective model to bridge the technical skills gap. Retraining existing talent rather than relying on external hiring is less costly; turnover costs can equal as much as 16 percent of an hourly-waged employee’s compensation or 213 percent of the salary for a highly trained position.31 Additionally, retraining allows companies to build upon their workforce’s institutional knowledge and not lose valuable time waiting for newly acquired workers to adjust to company practices. In many instances, the rapid evolution of digital technologies shortens the effective shelf-life of technical skills, which complicates the debate on identifying a cogent national workforce strategy to address skill shortages. In the meantime, relying on internal reskilling programs represents an anodyne response to the growing concern of skills mismatch in the intensely competitive ICT sector that allows industry leaders to boost market competitiveness. However, program adoption is unevenly distributed across the ICT sector, and many companies continue to rely on a mix of workforce strategies to assuage workforce challenges. AT&T has emerged as an industry leader in workforce retraining initiatives and has adopted two main strategies to equip 95 percent of its workforce with highly sought-after skills by 2020.32 First, it has invested in creating new career pipelines to attract entry-level talent. Second, it has invested in a variety of training schemes, including a $1 billion web-based global retraining program comprised of online courses; academic-degree-based partnerships with Coursera and leading universities such as Georgia Tech; and an online portal that allows employees to follow a career road map to transition into new roles. AT&T’s investments have been paying off: Employees who are retraining are twice as likely to be hired into advanced emerging occupations (e.g., data scientists) and four times as likely to advance in their careers. AT&T’s success in and commitment to building an internal program rather than relying on external hiring has become a model for other IT leaders who are slowly adopting the same approach. Similarly, IBM has committed $1 billion to training and development programs for its U.S-based employees over the next four years.33 However, the company’s initiatives are unique in its attempts to make career inroads into the IT industry more accessible to a wider pool of candidates rather than a select few. First, the company has issued over a million digital badges in every country–digital credentials that showcase completion of a class or training and serve as a signal to IBM and the broader labor market of newly acquired skills. Second, IBM is recruiting highly skilled candidates through its “New Collar Certificate Program” by placing a premium on sought-after skills as opposed to formal academic credentials like a four-year degree. Regardless of where the skills were attained (i.e., at a coding boot camp or community college), there will be roles at the company for these applicants as long as they possess the requisite capabilities. Ultimately, due to the nature of contemporary jobs and the diversity of workplace settings, online learning content and micro-learning are sure to become increasingly popular among organizations to boost business value in the digital economy. Regulatory uncertainty and the rise of massive security breaches present major challenges for the IT industry moving forward. The proliferation of AI, machine learning, and robotic automation technologies across leading IT service companies supports the industry’s robust outlook. However, widespread security concerns place millions of consumers and the small business ecosystem at risk. What’s more, the radical shift in political attitudes around critical domestic issues (particularly trade and immigration) calls the industry’s future into question. Ambiguities around data privacy, cybersecurity, and trade warrant particular attention. Political tides are influencing the ICT industry with regard to data protection and broader concerns. In terms of regulations, escalating trade tariff frictions between the U.S. and China concerning trade imbalances have deflected attention from the silent rise of regional data protectionist policies. In 2018, China, India, and Vietnam introduced data protectionist legislation to circumscribe cross-border data flow. These sovereign governments have pointed to data protection as paramount in mandating local storage of consumer data. Regardless of the motivating factors, such restrictions limit the free flow of data across international borders with important consequences for the IT industry. Potential outcomes include increased compliance risks, growing infrastructure costs to maintain fractionalized enterprise data storage systems, and a corresponding rise in investments to navigate transient compliance requirements. Digital privacy protection is of critical importance in a vibrant digital society that respects consumers’ rights to control access to their data and balances safeguards within an ecosystem that supports innovation and growth. However, the pace of massive data breaches has eclipsed regulators’ ability to constrain these events and improve institutional accountability. The lack of a cogent national regulatory framework to address data privacy challenges emerging from massive amounts of business and consumer-related data, coupled with shifts in individuals’ privacy preferences, presents inherent threats to the IT industry. Operational planning is particularly at risk. The absence of clear, consistent signals from federal authorities on the future of data privacy regulation in the U.S. could be costly for the IT industry, along with non-IT stakeholders. Nevertheless, two regulatory models provide insight into future directions for an eventual U.S. policy on digital privacy. Globally, Europe’s General Data Protection Regulation (GDPR) provides a regulatory model that, at its core, aims to protect consumers and increase control over their personal data via informed consent. GDPR also incentivizes enterprise compliance and accountability through punitive fines. Domestically, the state of California has emerged as a vanguard in data protection, promulgating The California Consumer Privacy Act (CCPA) as a legislative response to data privacy concerns. CCPA closely parallels GDPR’s structural design and reliance on penalties for non-compliance. GDPR and CCPA also converge on the importance of data privacy for consumers. Despite obvious consumer benefits, these regulatory regimes present substantial non-compliance risks for the IT industry in terms of pecuniary harms and reputational damage. The political landscape also carries major implications for global trade and the flow of workers across borders, heightening the complexities associated with cross-border movements of diverse forms of capital. National political arguments prioritizing domestic economic interests have supplanted transnational and global cooperative relationships that have been the hallmark of trade norms for the last several decades. Conversations around cross-border movement are now generating tangible policies rather than abstract political discussion. The recent partial shutdown of the U.S. government offers worrisome evidence of this shift and exacerbates financial instability as a consequence of the U.S.–China trade wars, which have adversely affected financial markets around the world. What’s more, anti-immigrant populist sentiment influenced the Brexit referendum vote, which mandated the U.K.’s exit from the European Union. Beyond the destabilizing economic uncertainty stemming from this vote and subsequent political stalemate around plans to implement a required exit, the anti-immigration agenda was clear. Immigration friction sentiments formed a critical flashpoint of the Brexit discourse, one that has since been replicated in the German and U.S. elections. Besides this, negative sentiments toward immigrant labor have shaped political debates and national policies that promote closing borders to important labor flows of highly skilled immigrants. Recently, through a series of legislation under the “Buy American/Hire American” executive order, the U.S. has applied greater scrutiny and more stringent requirements to employment-based immigration (specifically the H-1B temporary foreign worker visa). These impending laws are expected to disproportionately affect the ICT industry. According to the Department of Labor’s H1-B visa statistics, 57.6 percent of certified positions for FY 2018 were related to jobs in computer programming and software development fields; in FY 2017, computer-related occupations accounted for 70 percent of successfully awarded visa applications. On Feb. 22, 2019, the Department of Homeland Security proposed a ban on the work authorization of 100,000 H-4 visa holders—a special work authorization for spouses/children of H-1B visa holders who are awaiting permanent residency status—reducing the attractiveness of the U.S. to foreign workers and their dependent families. With foreign workers and H-1B holders constituting most of the talent pool in large tech companies, such a development could greatly disrupt companies’ business models and workforce strategies. Final implementation is uncertain given anticipated legal challenges to the proposed rule. Furthermore, recently implemented administrative changes to the H-1B visa lottery compound the effects of anti-immigrant labor market policies. Despite the unknown final impact of the lottery change, summarily these rules and regulations alter competitive dynamics among highly skilled workers. By reducing the dominance of large IT staffing firms (e.g., Tata Consultancy Services, Infosys, and Wipro) in employment-visa based petitions with candidates who fail to fit “highly skilled occupational requirements,” many major tech firms will lose out on a valuable talent source of permanent and temporary workers. To that end, heightened workforce pressures across the ICT industry will likely cause many IT firms to relocate more operations offshore to compensate for the shortfall in domestic-based foreign talent if workforce training efforts cannot meet the industry’s demand for highly skilled workers. The IT industry is shaping the U.S. economy in several important ways, most notably with respect to sectoral innovation, economic growth, overall business operations, and regulatory policy. It is clear that the industry, despite its relative immaturity compared with more established sectors, will remain a key player in the nation’s economic landscape. However, its prospects are tempered by looming issues related to international affairs. In the long run, closing borders presents significant risks to the IT industry and may come at the expense of the industry’s innovation, competitiveness, and capacity to develop and distribute products and services. Ensuing responses to the turbulence around trade wars, immigration, and cross-border communication will guide the industry’s development in potentially drastic ways. Such changes, however difficult they are to forecast, will likely bring ripple effects to IT and related industry as well as the economy at large. Industry experts should thus continue to monitor developments in IT and adjacent areas carefully to safeguard its evolution, provide targeted workforce recommendations, and devise appropriate protectionary measures for businesses and consumers. Apple, AT&T, Cisco, IBM, Lockheed Martin, and Verizon are donors to The Brookings Institution. The findings, interpretations, and conclusions posted in this piece are not influenced by any donation. Brookings recognizes that the value it provides is in its absolute commitment to quality, independence, and impact. Activities supported by its donors reflect this commitment. International Telecommunication Union (2018). Measuring the Information Society Report, 2018(1), 1-189. "Private Services-Producing" consists of the following: utilities; wholesale trade; retail trade; transportation and warehousing; information; finance, insurance, real estate, rental, and leasing; professional and business services; educational services, health care, and social assistance; arts, entertainment, recreation, accommodation, and food services; and other services, except government. "Private Goods-Producing" consists of agriculture, forestry, fishing, and hunting; mining; construction; and manufacturing. ICT-Producing consists of computer and electronic product manufacturing (excluding navigational, measuring, electromedical, and control instruments manufacturing); software publishers; broadcasting and telecommunications; data processing, hosting and related services; internet publishing and broadcasting and web search portals; and computer systems design and related services. Fakieh, B., Blount, Y. & Busch, P. (2016). SMEs and cloud computing: the benefits to the national economy and global competitiveness. Paper presented at the meeting of the 13th European Mediterranean & Middle Eastern Conference on Information Systems, Krakow, Poland. Accessed March, 2019]. Available at: https://www.researchgate.net/publication/329013899_SMEs_Research_The_Continuous_Need_to_Explore_the_ICT_Potential#pag:3:mrect:(414.60,250.62,78.61,8.96). Luo, Y. and Juan Bu. (2016). How valuable is information and communication technology? A study of emerging economy enterprises. Journal of World Business, (51), 200-211.